ALICE Training Institute was established by a former police officer. Fifteen years later, ALICE Training continues to be the leading active shooter response program in the country due to the Police / LE community. Police officers know the volatile dangers of any aggressive intruder and active shooter event. These attacks can happen unexpectedly and produce devastating outcomes within a few short minutes making even the fastest law enforcement response-time futile. 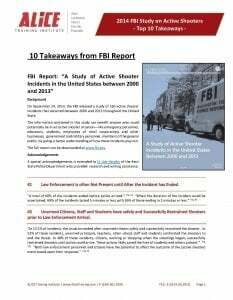 According to the FBI’s 2014 report on active shooter situations, 69% of incidents lasted less than five minutes. 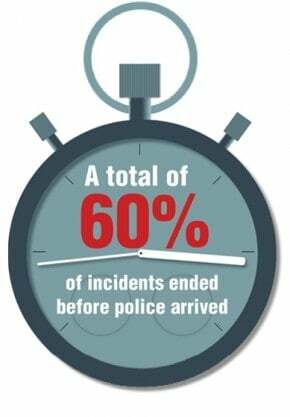 Consequently, 60% of incidents ended before police arrived. Police officers understand the necessity of teaching proactive safety and response tactics to citizens. You conduct the drills. Our e-Learning will take care of the classroom learning. Becoming a certified ALICE Instructor allows you to train participants who have completed the ALICE e-Learning within your organization. This enables you to focus on high level security plans and the facilitation of training drills specific to your organization. Host an ALICE Training Class. Your Community with Thank You! 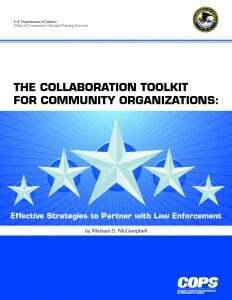 Becoming a Hosting Partner with ALICE Training is an excellent way for a Police/LE Department to build trust and goodwill within their community. Demonstrate your commitment to community safety by hosting an ALICE Active Shooter Preparedness class at or near your organization. 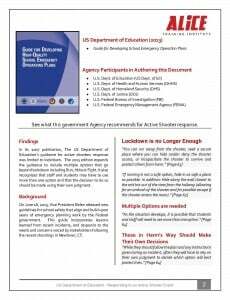 Police/LE, K-12 Schools, Healthcare Facilities, Higher Education, Businesses, Government, Houses of Worship across the USA are seeking solutions on how to respond during a violent intruder event. ALICE training is a perfect opportunity for law enforcement to foster community partnerships while making the community safer. We know time and budgets are precious so we help our Certified Instructors each step of the way. Earning the ALICE Instructor certification puts you in a special league, positioning you as a leader and role model. 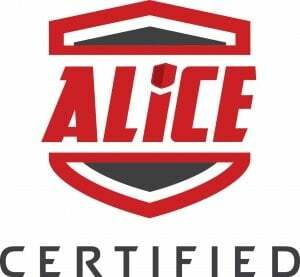 As an ALICE Certified Instructor, you’ll learn how to master the training drills that represent a vital part of our training. 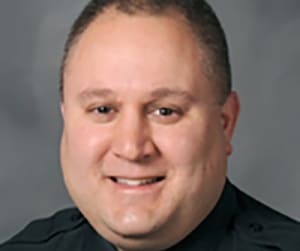 Lt. Hendry is an expert consultant to the Ohio Department of Homeland Security for civilian response to Active Shooter incidents. For the last six years, he searched to discover the origin of lockdown. 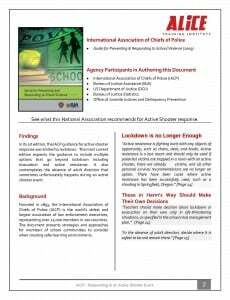 Where did it come from and who developed the protocol for schools? 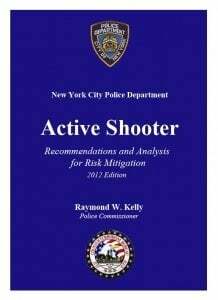 Why were specific procedures followed when they seemed to be counterproductive to surviving active shooter events? Why was hiding under a desk the best tactical decision in a building where most rooms are occupied by 20 or more people?